The Yukon state government in the far north of Canada has announced that some miners have made significant discoveries in the permafrost. While searching for gold, the miners found a mummified wolf cub and a caribou calf from the last ice age. The discovery of the two animals which are almost perfectly preserved is rare and exciting for both scientists and the community. The mummified remains are important as they can allow scientists to better understand the lives of animals in the ice ige and conditions in the environment tens of thousands of years ago. In territories beyond the Arctic circle, there have been numerous mummified remains of extinct and extant animal species from the ancient past. In Siberia, there have been exhilarating finds of mummified animals in the permafrost. In August 2018 an almost complete 40,000-year-old foal was discovered in the Yakutia region of Siberia, which is renowned for such discoveries. The remains can be near perfectly preserved because of the extreme Arctic conditions that freezes the dead animals slowing or even halting the natural processes of decay. The latest announcement was made in the Yukon, the north-western Canadian territory, famed for the Klondike Gold Rush in the late nineteenth century. Today, the area is dominated by large, dense forests but in the past it was part of the desolate tundra of Beringia. Here extinct animals such as woolly camels and mammoths lived alongside the ancestors of existing mammals such as caribou, who now live in the Yukon. The discovery of the caribou was made by some miners who continue to mine gold in the Yukon long after the end of the Klondike Gold Rush. The mummy was found in a gold mining region that is owned by a well-known Canadian reality TV-star in June 2016. The caribou was found at ‘the site of an 80,000-year-old volcanic ash bed,’ reports USA Today . In July 2016, the wolf-pup was discovered by another gold miner working in the area. Both were very well-preserved and according to the Smithsonian.com, ‘both animals’ fur, skin, and muscle are almost perfectly preserved.’ Due to their remarkable condition these offer some of the oldest specimens of mummified mammal soft tissue in the world. Are These Tools Left by Paleolithic Travelers on the Beringia Land Bridge? A Conspiracy of Silence: Are We Older Than We Think We Are? The two specimens were removed from the ground and scientists carried a range of tests on the mummified remains. Carbon dating revealed that the two specimens lived over 50,000 years ago and the caribou probably lived earlier than the wolf pup. These make them among the earliest specimens that have ever been uncovered in an Arctic region. The scientists now intend to carry out genetic testing to learn more about the animals of the ice age. This is not the first significant find in the Canadian permafrost. Some thirty years ago two miners found the incomplete mummified remains of a long extinct horse species, that is known as the Yukon horse . However, the discovery of the caribou and the wolf pup are very significant as they are the oldest specimens with soft tissue that have been unearthed in Canada. Now the Canadians have specimens that can rival anything found in Yakutia in Siberia. 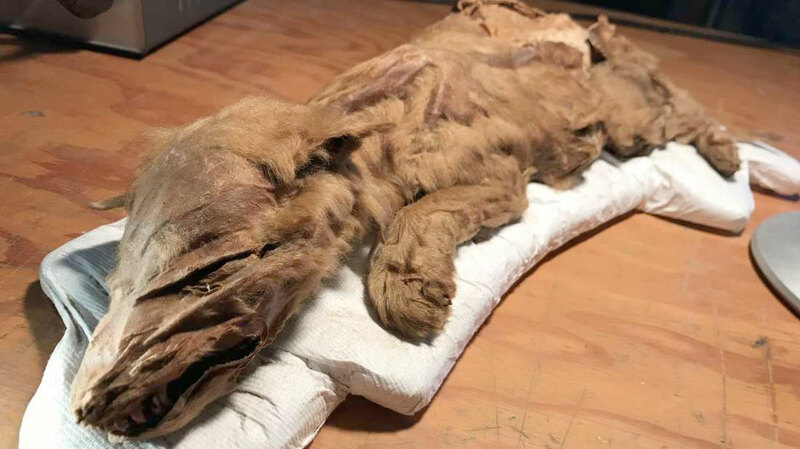 The mummified animals will stay on display in Dawson for the remainder of the month, after which they will be incorporated into an exhibit at the Yukon Beringia Interpretive Centre in Whitehorse.